Our mom, Shirley Hirsh Nason, passed away on Wednesday morning, November 8 at the age of 98. She was a wonderful person with a very caring and giving personality, and will be greatly missed by many. 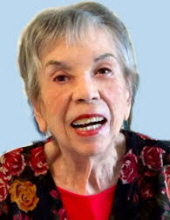 Shirley is survived by her children Bruce Hirsh, Kenneth Hirsh, and Kathy Hirsh. She is also survived by her stepson Barry Nason, son-in-law David Graumlich, daughter-in-law Lisa Hirsh, nieces Judith and Barbara Barrera and many grandchildren and great-grandchildren. Rest in Peace, Mom. Our love is eternal. To plant a tree in memory of Shirley H. Nason, please visit our Tribute Store. "Email Address" would like to share the life celebration of Shirley H. Nason. Click on the "link" to go to share a favorite memory or leave a condolence message for the family.